Grayson’s birthday party was yesterday afternoon. We went small this year- just family, at our house. In addition to grandparents and aunts and uncles who live here, we were so touched that my brother Peter and his wife Megan flew in from Nashville to help us celebrate. My brother Matthew also drove in from Waco. So sweet. 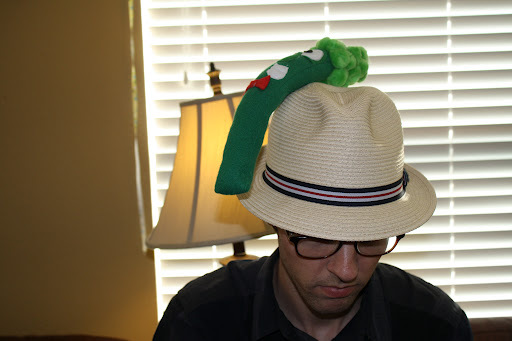 The theme for the party was A Very Veggie Fiesta, combining two of G’s favorites- Veggie Tales and Mexican food. For a party I basically threw together in a few days, I think it turned out pretty cute, and everyone seemed to have fun. 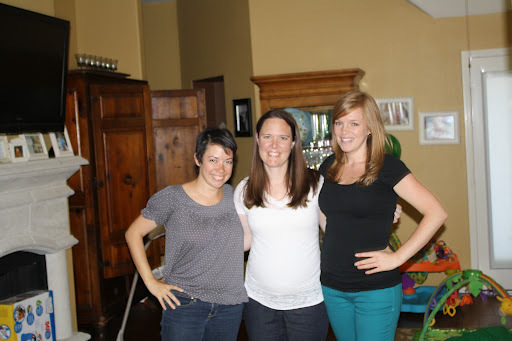 Of course, I had a TON of help from my sister and sisters in law- just wait until you see this cuteness. 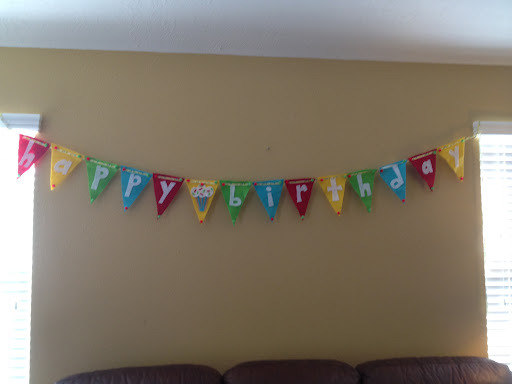 The decorations: since the colors were similar to last year’s party, we used the banner Hannah and I made last year. 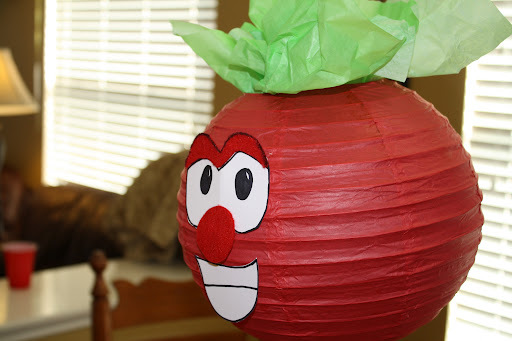 We bought red paper lanterns at Hobby Lobby and turned them into Bob the Tomato. 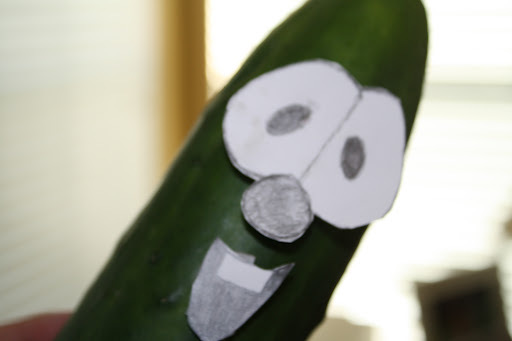 We did the same thing with green balloons to make Larry the Cucumber. And we couldn’t resist making “real” Larrys. 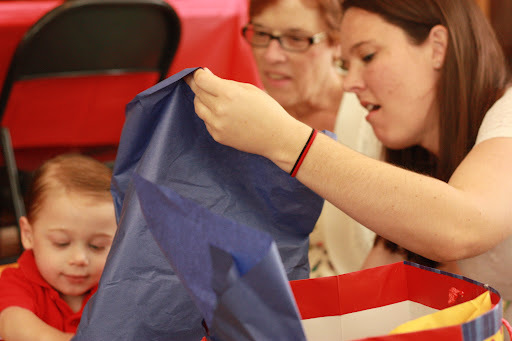 Before the party started, Aunt Hannah wanted Grayson to open his present. He was super excited about the tissue paper! Ok, you ready to see the cutest thing EVER?!?! Check out what Hannah and her mom MADE for G. Seriously, it is just too precious for words. 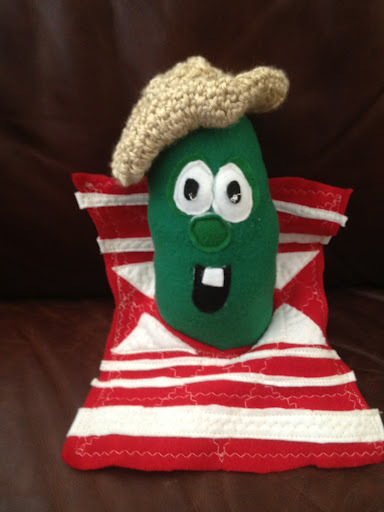 And you have to look at Larry- he has a sombrero and a pancho- ha ha! Cake Time! 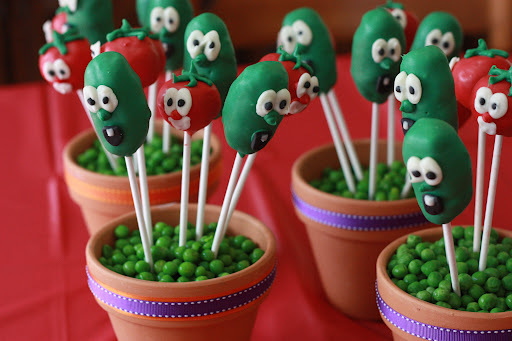 The oh so talented Hannah made these utterly adorable cake pops, displayed in flower pots with peas- oh, the cuteness. 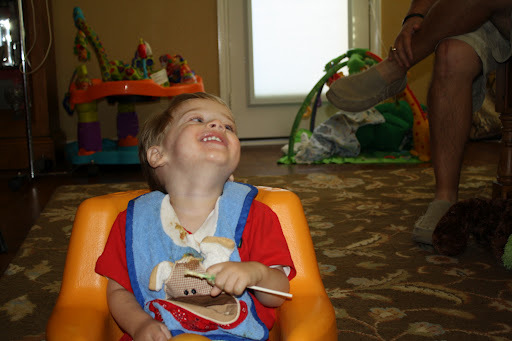 I think the highlight of the party was when we presented Grayson with his cake pop. 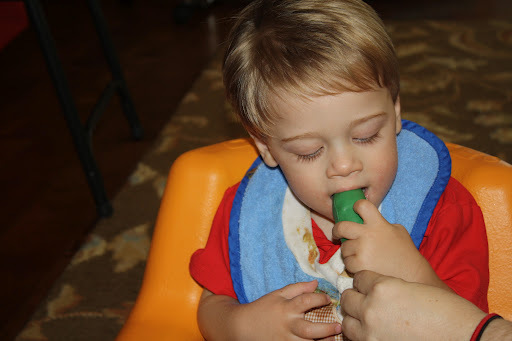 He of course put it in his mouth, but I don’t think he had any idea he was biting into food. He bit the head right off Larry, which apparently was hilarious, because he burst out laughing. It was oh so cute, and we all laughed (and cried a little). 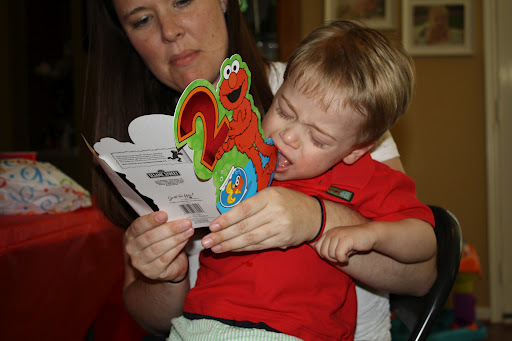 It was wonderful to be surrounded by family on our sweet boy’s 2nd birthday. We have so much to celebrate! 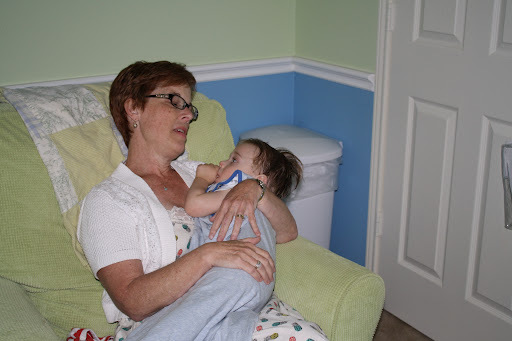 After the birthday boy went to bed (is there anything better than Grammie cuddles at bedtime? ), my goofy siblings had some fun- they seriously crack me up! My brothers’ wives (and me). I love these girls SO much! 2 Years: Happy Birthday Grayson! Could this BE any cuter?!? I'm going to hire you to do Larkin's party next year, no kidding. Happy birthday, G Force! You are a joy and I can't WAIT to see you this week! So fricken cute!!!! Seriously every aspect of the party! LOVE IT!!!! 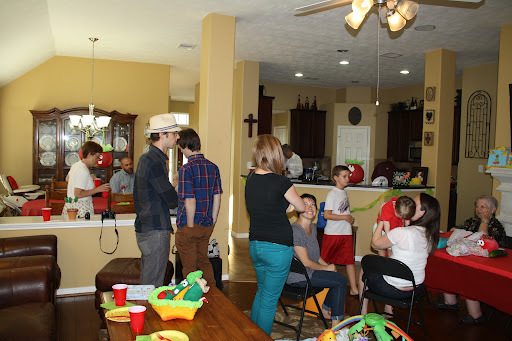 Even though it wasn't a huge party, it seems like the best possible party for Grayson. Happy Birthday little man! Love love love! It's super cute and looks like you all had a ton of fun. Happy Birthday Grayson! Oh my goodness, the cuteness is overwhelming!!! I adore the tomato lanterns and cake pops, and his own set of pals????? Amazing!!!! What a wonderful and fun party, so happy it was a great time!!! 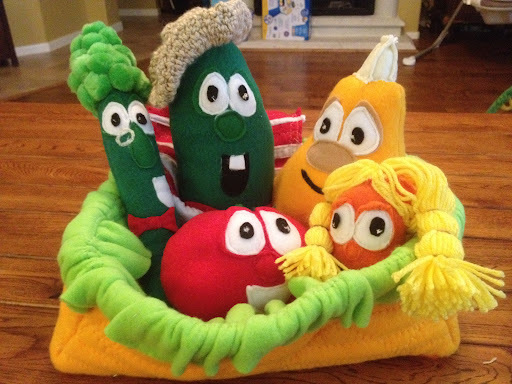 I admit to never having seen (or heard) Veggie Tales, but this was adorable!!!! the cake pops – eek so darn cute! So glad the party went well 🙂 And the pic of G with his Grammie is so sweet! 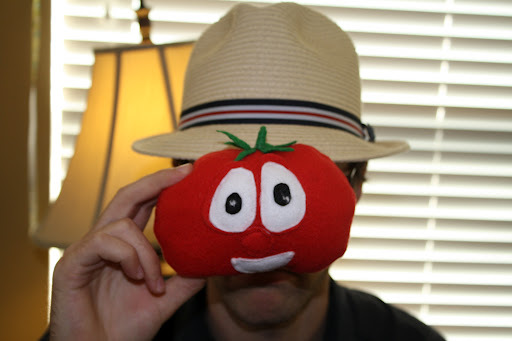 OH MY GOSH the cake pops, the home-made veggie tales, the REAL larry?! this was the cutest party EVER and graysons smiles put the icing on the cake, pun intended. what a great celebration!!!!!! 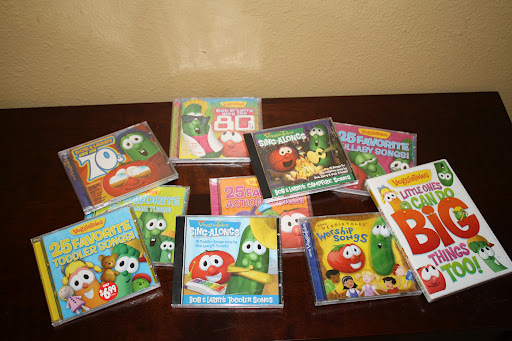 Looks like such a fun party, plus I love the Veggie Tales Theme! Oh. My. 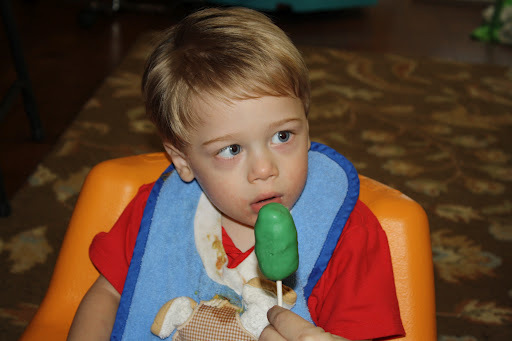 Goodness…First, let me say that my heart just EXPLODED over that pic of G and the cake pop. PURE JOY!! !The party was amazing– I can't believe you pulled it together in a few days. The lanterns, balloons, food, gifts. It was all just perfect… which is exactly what G deserves.Happy Birthday, Grayson!! Darling party and pictures of the birthday boy. 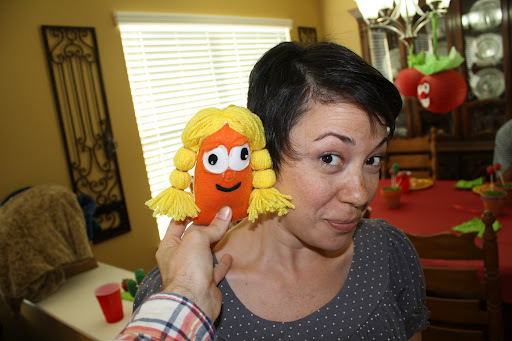 Love all the details of the Veggie Tales.. Love the cake pops and the stuffed veggie characters. Happy Birthday Grayson!!!!!! It's a Veggie Extravaganza! 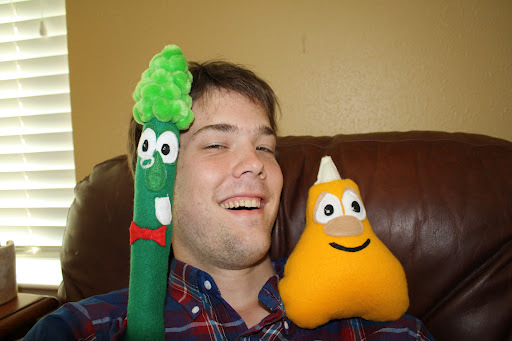 How have I not thought to look at Veggie Tales yet? Everything is so adorable! But especially the G-Man and his Grammie. Ugh. Loved that pic! What a hit! LOVE all the decorations and cake pops! Fantastic way to celebrate your little man!! Adorable! You guys did a great job! 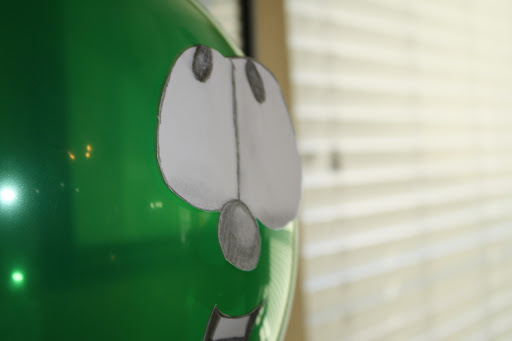 Love, love, love the veggie tales party theme! So glad that Grayson had such a funny birthday surrounded by love and happiness. Cuteness is right! I love that gift from Aunt Hannah and oh, those cake pops! 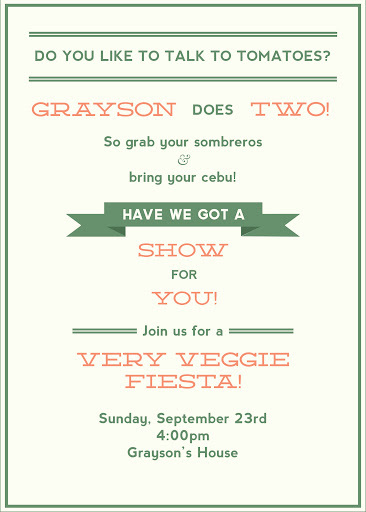 Too cute for words!I love your invitation. I mean – LOVE IT! What a fabulous birthday party!!! I'm so glad you and your family had such a nice time together. You are right – you have a lot to celebrate. Hugs to you and Grayson!! !